Rupert Murdoch is the chairman and CEO of News Corporation, one of the largest media companies in the world. Rupert Murdoch is an iconic media mogul that has a net worth of about $20 billion. 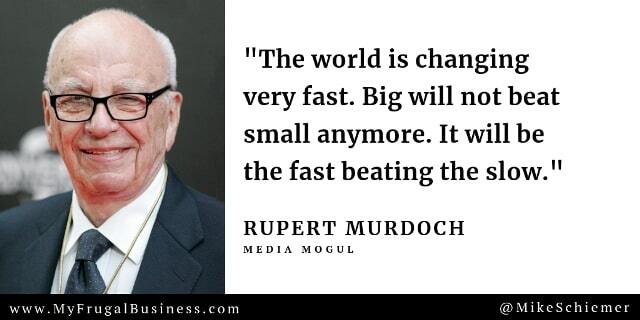 Rupert Murdoch is an inspirational businessman with plenty of quality quotes. Here are some of my favorite motivational business quotes from legendary CEO Rupert Murdoch. 1. "When you're a catalyst for change, you make enemies - and I'm proud of the ones I've got." 3. "The world is changing very fast. Big will not beat small anymore. It will be the fast beating the slow." 4. "I felt that it's best just to be as transparent as possible." 6. "Money is not the motivating force. It's nice to have money, but I don't live high. What I enjoy is running the business." 10. "The buck stops with the guy who signs the checks." 12. “In motivating people, you've got to engage their minds and their hearts." Thanks for the quality quotations Rupert Murdoch. Keep crushing it! I hope you enjoyed this article about motivational quotes from legendary CEO Rupert Murdoch of News Corp. Interested in more articles about inspirational quote compilations?